I've been called a lot of things in my lifetime, but "bottle-cap collector" isn't one of them. I'd gladly answer to that title, though, if it meant I could lay claim to even a few of the 30 or so Super Mario Bros. bottle caps Pepsi placed on its Japanese products in 2005. Although I think my favorite (of the ones I've seen) is the Cheep-Cheep cap above, all of them are pretty cool. To see more of these drool-worthy collectibles, check out this post over at famicomblog.blogspot.com. Labels: blogs, bottle caps, Cheep-Cheep, collectibles, collection, Japan, nintendo, Pepsi, Super Mario Bros.
Oh jeez, I think I have some of these. It's a really strange story of how they came into my possession too. Well, not REALLY strange, but at least a little. The short version is I went to a total stranger's house because of a post he made on a bittorent forum (of all places) about getting rid of games. I thought it was a trick/might die/etc but he was legitimately giving away his older gaming collection stuff. It appeared used and loved, not stolen :P. Either way, he had a big box of keychains and small toys and these bottlecap guys were in there. So I took some home with me! In retrospect I wish I had kept in touch with the guy, but that's the way the cookie crumbles sometimes. Still, good for you! How nice of someone to give away their games and game-related stuff. Pepsi related gaming stuff has always looked good. When the DS first came out, one of the only other colours available was this Pepsi Twist limited edition, which could only ever be won, I think, and came with like.. Headphones with the Pepsi logo on them too, or something. Want badly. I love that hammer bro. How COOL!!! Yet again, everyone is cooler than America. Oh, yeah, the Hammer Bro is cool, too. I like the little Luigi climbing the vine, too. It's a shame these weren't used in NA, too. People would have loved them here! I can't believe they released a Hammer Brother and a Hamma' Brotha', as Robb and I say. 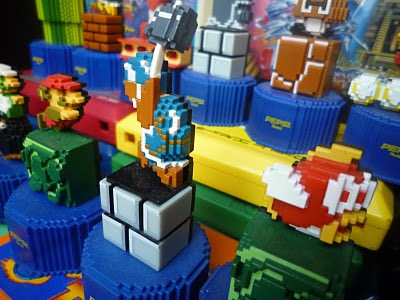 The one in Bowser's castle is the only black hammer brother. You know you're forcing me to go back and play through Super Mario Bros. again because of this comment, right? I honestly don't remember seeing a Hamma Brotha in the game! :-) It's the last thing you see before you get to the final Bowser...the real Bowser. Ah, that's why I don't remember it. I haven't played all the way through SMB in a very long time! Glad to know I'm making you jealous! :) I like the Cheep Cheep one too. You're *always* makin' me jealous, Sean!